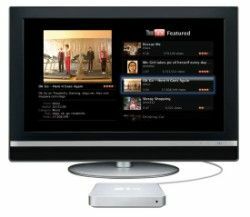 Apple plans all-in-one HD TVs for 2012 | What Hi-Fi? We have an industrial strength sieve for the endlessly hard-working Apple rumour mill but occasionally one (or two) snippets catch our eye. The latest says Apple is expected to launch a range of three HD TVs complete with integrated surround sound speakers. The Apple Insider site reports a Wall Street analyst issued a note to investors based on his findings from a number of developer events. As ever, take that pinch of salt, but Apple's step in to the world of television – and presumably Smart ones at that – has been rumoured for some time. The company already has its Apple TV net boxes and delivering a TV with this capability integrated, bringing with it direct acces to iTunes TV and film content, is an easy enough leap of faith to make. Trip Chowdhry, the analyst in question, reckons on 2012 for a release of three screens at different sizes, each with integrated speakers. We shall see. In other news, the BBC reports Apple is now "holding more cash than USA", after the US Treasury released its latest figures. The US Treasury has an operating cash balance of $73.7bn, while Apple has $76.4bn sloshing around in its coffers. With net income over the three months to June coming in 125% higher than a year earlier, Apple's reserves show no signs of dwindling.